Canon i-SENSYS MF515x Printer Driver. For printing, scanning, copying and faxing documents, you can buy Canon i-SENSYS MF515x MFPs, which will be an ideal choice for those who want to save money and optimize their work. Canon i-SENSYS MF515x with touchscreen 3.5-inch color display and laser monochrome technology will print text documents with resolution up to 1200 x 1200 dpi on ordinary, secondary and thick paper, labels, postcards and envelopes with a density of 60 to 199 g / m2 of maximum format A4 at a speed of up to 40 ppm. The two-sided feeding module helps to save paper by printing and copying from both sides of the sheet. You can scan documents to a USB drive or e-mail, to a local folder, to the cloud and to an FTP server, and copy with a step-by-step scaling in the range from 25 - 400% with erasing the frame and sorting 2 on 1 and 4 on 1 sheet. 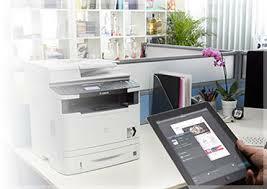 Sale of MFP Canon i-SENSYS MF515x with Wi-Fi interface and a print resource of up to 100,000 pages per month. Your employees working in intensive mode will appreciate fast and high-quality printing and copying at an impressive speed of up to 40 pages per minute. With Canon i-SENSYS MF515x color touch screen, convenient control, regardless of user skills, quick start technology Quick First-Print and capacity of trays for paper in 600 sheets, will allow your employees to work faster and more efficiently. Confidential documents are protected by secure printing using the PIN code for printing from a PC or mobile device. Canon i-SENSYS MF515x supports Apple AirPrint (iOS) and Mopria (Android), so your employees can print documents from any connected device. They can use a variety of advanced features with the Canon PRINT Business application, and also connect the device to the Google Cloud Print service account in seconds. Flexible workflows of the MF515x printer, integration with cloud services, MF Scan Utility (for PCs and laptops) and Canon PRINT Business application (for mobile devices) can save time for employees. Workgroups can use their favorite cloud storage, such as Google Drive and DropBox, to download, digitize and transfer documents anywhere and anytime. Thanks to the advanced network connectivity, the MF515x fits perfectly into your corporate network. The ability of Wi-Fi and Ethernet connections, as well as support for PCL5e / 6 and Adobe PostScript print control languages, allow easy integration into managed network environments.